Click here for an "An Astronaut's View of Mainland Tasmania". Warning: Large file [240Kb], but worth it. By BRYONY NAINBY | The whimsical, wonderful and weird ways in which Tasmania’s distinctive triangular shape has been used by illustrators, cartoonists and graphic designers are featured in an online exhibition created by the State Library of Tasmania. One of the most popular items in the exhibition is a 1926 advertisement from the Christmas edition of the Illustrated Tasmanian Mail. Under the heading, “Look! says Tasmania”, a schoolboy character with a giant Tasmania-shaped head points out the many wonderful benefits, such as “Trams, Trains and Town Illuminations”, generated by hydroelectric power. The advertisement was designed by Alex Gurney, a cartoonist, illustrator and creator of the Bluey and Curley comic strip, who was apprenticed to the Tasmanian Hydro-Electric Department. 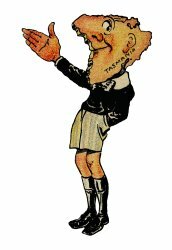 During his life his cartoons appeared in the Illustrated Tasmanian Mail, the Bulletin, Melbourne Punch and Smith’s Weekly, and in 1926 he published a book of caricatures of leading Tasmanian personalities, Tasmanians today. 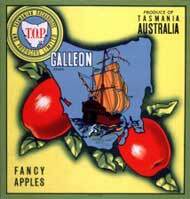 Other highlights include a very amusing 1950s cartoon version of an astronaut’s view of Tasmania, and many colourful and quirky apple case labels. 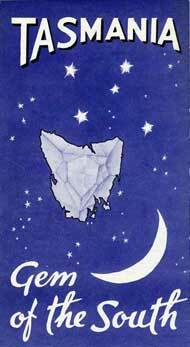 The triangular shape of Tasmania was not actively exploited by designers until the late 20th century, but it quickly became an iconic symbol of community activism. In the No Dams campaign to save the Franklin River, the conservation movement used the triangular shape to great effect, beginning with posters for the Tasmanian Wilderness Society featuring a platypus inside an inverted triangle. The map of Tasmania together with a pink triangle was first used on posters in 1988 by the Tasmanian Gay Law Reform Group at their Salamanca Market stall in Hobart.